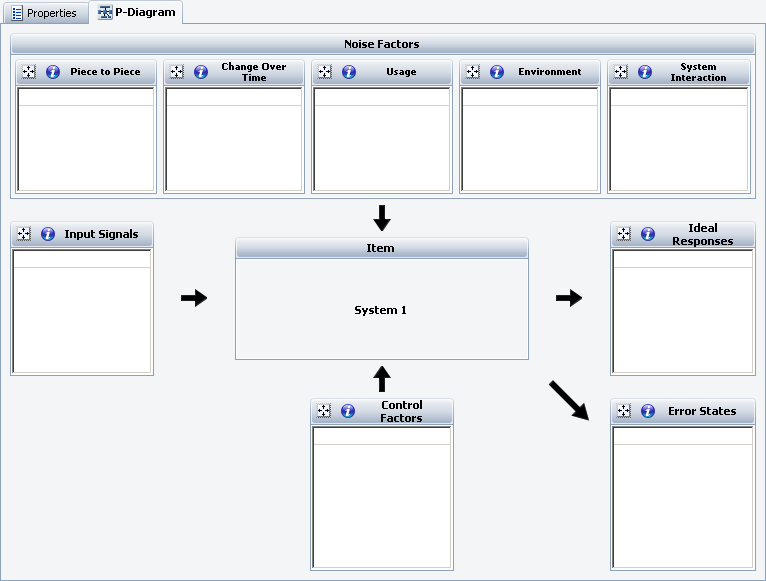 The ability to create Parameter Diagrams has been added in Xfmea Version 11. 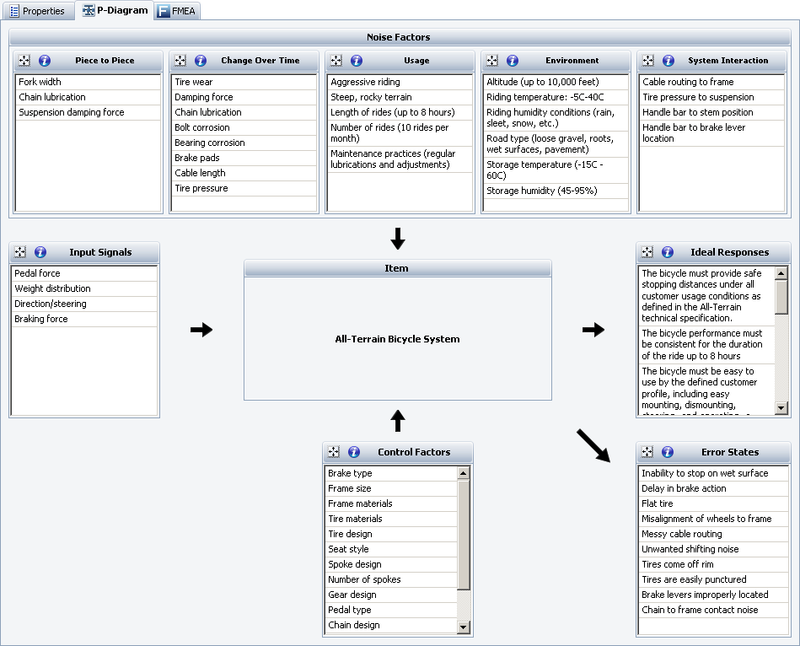 A structured tool that identifies the inputs from a system and relates those inputs to the desired system outputs while considering the controlled and uncontrolled factors, the Parameter Diagram can provide important input to System and Design FMEAs. In this article, we will discuss this new tool and how to put it to work. First, a little history about Parameter Diagrams, or P-Diagrams. J. M. Juran explained the concept behind P-Diagrams in 1993. There was the identification of performance requirements of the item as an output, the combination of engineering principles and design characteristics as input and the need to be robust to uncontrollable noise factors. In 2008, the Automotive Industry Action Group introduced P-diagrams in the 4th edition of their Potential Failure Mode and Effects Analysis reference manual as a "structured tool to help teams understand the physics related to the function(s) of the design." Since 2008, several other industries have found value in the use of P-Diagrams. So, what is a P-Diagram? P-Diagrams are part of the preparation work done before you actually start to complete the Design or Process FMEA form. The input signals from the system/customer and the functions or outputs produced by the item under investigation are enumerated in the P-Diagram. In addition to the "ideal" functions produced by the item, the P-Diagram captures the unwanted or undesirable outputs or side effects. Noise factors that will reduce the effectiveness of the ideal function are considered. Design elements of the item are then listed as control factors, which will impact the design ability to be robust to the noise factors and minimize the effects of the unwanted output. Figure 1 shows a typical P-Diagram template. The following is a further description of the elements in a P-Diagram. Input Signals describe the energy sources needed for the item to fulfill its intended functions. Input Signals can include energy sources from other subsystems in the design, the customer or the environment. Whenever possible, Input Signals should specify a measurable range and dimension. Ideal Responses are the primary intended functional output of the item. In a pure sense, "ideal" refers to the efficiencies of the transfer of the input signal to functional requirements. 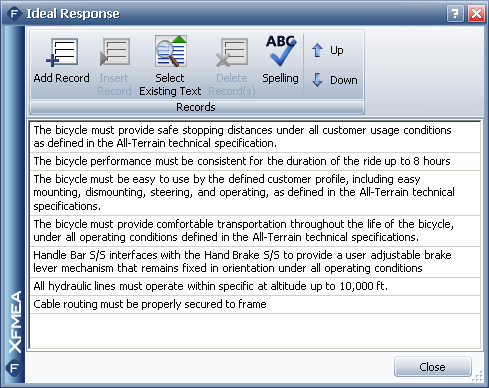 However, in a practical sense, Ideal Responses are a list of all functional requirements for the item. Error States were once described as those error or failures that keep the engineer up at night. Error States should list the failure modes or effects of failure as defined by the end user. They can be considered as unwanted outcomes from the Input/Process/Output process. Consider touch (feel), sound, smell, appearance and/or taste when brainstorming unwanted states. Noise Factors reflect the real world usage of the item. If the design does not consider the impact of the Noise Factors, the item may not perform its intended functions to the acceptable level. In other words, the design should be robust to the Noise Factors. Noise Factors are typically broken into the following 5 categories. Piece to Piece is the manufacturing variation as the result of the mass production of the item. Piece to Piece variation considers those design parameters that are outside the print specification. Some examples include variation in raw materials, variation in plant processes and variation in component dimensions due to tool wear. Change Over Time refers to the normal degradation of the item over time that can result in performance degradation or loss of function. A few examples include corrosion, wear, fatigue, organic/inorganic aging, build-up of impurities and polymer breakdown. Usage is anything that the customer can do with the product during its lifetime that would impact the item under investigation. It can include foreseeable misuse. Some examples include use of cleaning agents, erratic maintenance schedules, overloading, excessive use, using the product in applications not designed for, addition of aftermarket parts and the use of non-recommended materials such as lubricants or sealants. Environment is any kind of foreseeable condition that the item must work and operate within. Environment should consider the "operating" conditions of the item as well as the product. For example, the product may operate within an air-conditioned room, but the electronics within the product may be operating at a higher temperature. Environmental conditions can include temperature, humidity, voltage, vibration, altitude, sunlight, storage conditions and contaminants such as dirt, dust, bugs and small rodents. System Interactions consider any known item interaction with the affected neighboring systems. Interactions can be generated by direct contact or connection and by proximity. System Interactions include physical connections, energy transfer, communications and material transfer with other components or subsystems. System Interactions include the connections that are defined in the block diagram, but should not be limited to those connections. Control Factors are the design details such as materials, dimensions, processes and item characteristics that can be changed by the responsible engineering team. Control Factors should be chosen to minimize the impact of the Noise Factors on the item under investigation. Control Factors can be viewed as the potential causes in the FMEA. P-Diagrams can be developed at any level in the system hierarchy. Figure 2 shows a P-Diagram developed at the system level. A system level P-Diagram describes the Inputs, Ideal Responses and Error States for the system. Piece to Piece, Change Over Time and Control Factors tend to be more general in a system FMEA than a subsystem or component FMEA. The Usage and Environmental Noise Factors describe the expected system noises. System Interaction describes the subsystem interactions of the system. System level P-Diagrams can be lengthy, as there are more Ideal Responses, Control Factors and Error States for a system than a subsystem or component. Figure 3 shows a P-Diagram at a component level. The Piece to Piece variation is specific to the concerns of in the manufacturing and assembly process. The Change Over Time describes degradation mechanisms that can affect the performance of the tire. The Usage and Environment are also specific to the conditions that impact the tire. The System Interactions describe the interaction of the tire with the other components and subsystems. The Control Factors will include the materials, geometry, dimensions and specific quantities as the characteristics apply to the tire. So, your team has developed the P-Diagram. How is the information used in the FMEA? Ideal Responses become functions in the FMEA. As the team is brainstorming Ideal Responses, they should consider the Noise Factors and the Error States as a source for functions. Figure 4 shows a number of Ideal Responses that correspond to Noise Functions and Error States in the P-Diagram shown in Figure 2. For example, the Ideal Response "Cable routing must be properly secured to the frame" is generated from the Error State "Messy cable routing." The Ideal Response "The bicycle performance must be consistent for the duration of the ride up to 8 hours" is generated from the Usage "Length of rides (up to 8 hours)." 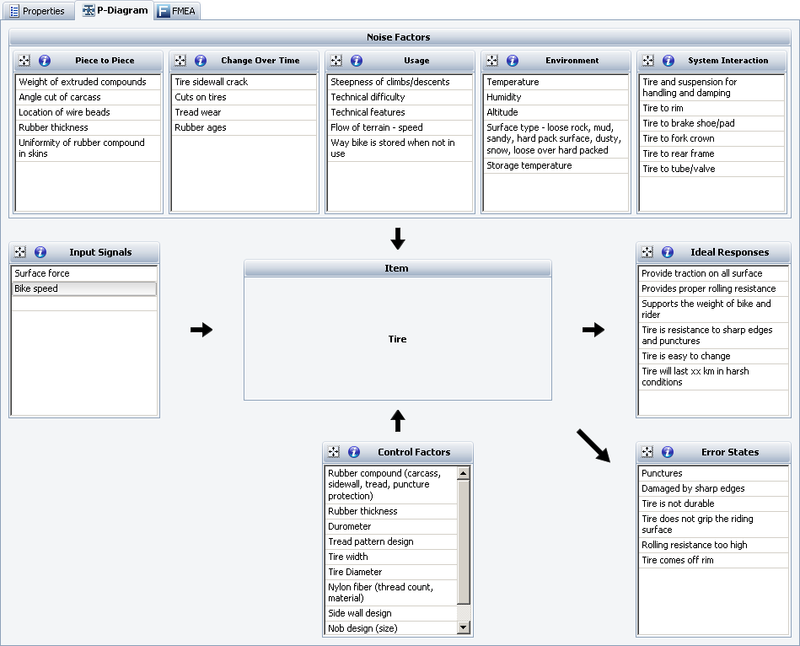 Xfmea makes it easy to insert the information developed in the P-Diagram into the FMEA. 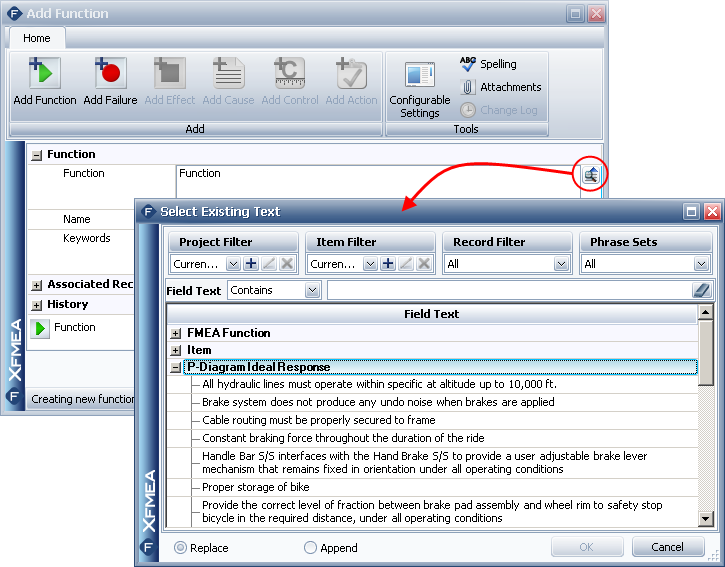 For example, the list of Ideal Responses is provided in the Select Existing Text window when adding functions to the FMEA (see Figure 5.) Similarly, Error States can be re-used as failures, and Noise Factors and Control Factors can be re-used as causes. In conclusion, the P-Diagram is a great starting point to your FMEA. It is used to communicate the factors that can influence your design as well as the factors that are controlling your design. It allows your team to define the Input/Process/Output for the item under investigation. It is used to facilitate brainstorming for Noise Factors in the five different categories and gives your team an opportunity to discuss Error States and Control Factors. Bottom line, the P-diagram allows the team to generate a more complete list of Ideal Responses that can be added as functions in the FMEA. Juran and F. Gryna, Quality planning and analysis from product development through use, 3rd ed. New York: McGraw-Hill, 1993, p. 256. Potential failure mode and effects analysis (FMEA). Southfield, MI: Chrysler LLC, Ford Motor Co., General Motors Corp., 2008, p. 21.